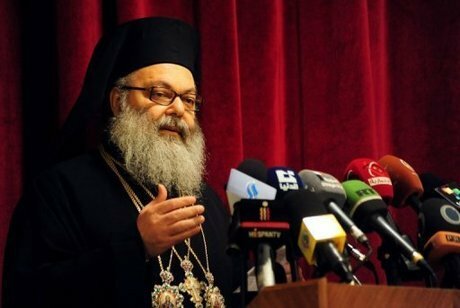 Greek Orthodox Patriarch Youhanna X Yazigi held on Saturday the international community responsible for the deadlock over the abduction cases in Syria. “The international community should end the case,” Yazigi said in a press conference. “The abduction of the two archbishops is among several other kidnapping cases that we can’t remain inactive about,” Yazigi stated. The two bishops, Youhanna Ibrahim and Boulos Yazigi, were kidnapped at the end of April, reportedly near the rebel-held town of Kafr Dael, near Aleppo in northern Syria. No group has claimed responsibility for their kidnap, but sources close to the Greek Orthodox Church and the Syrian authorities have claimed the kidnappers were “Chechen jihadists”. Concerning the situation in the neighboring country Syria, the Patriarch called for the establishment of a peaceful political solution in the country through dialogue. “The concerned countries should rise above their narrow interests and facilitate the appropriate foundation for dialogue,” Yazigi added. He condemned the breach of freedom in Syria, noting that Christians are not minorities and will hold on to their land. U.S. President Barack Obama said on Friday the United States was weighing “limited, narrow” action against Syria, insisting the world had a duty to act after it concluded Assad’s regime had gassed to death hundreds of women and children. Syria’s government has denied using chemical weapons and has pointed the finger of blame at “terrorists” — its term for rebels seeking to topple Assad.